"All work and no play makes Gulagulaananda a dull old man... well duller"
The objective of the game is simple. There is a "hero", a character you control with the keyboard arrows. There are some crates and some targets (golden balls). The goal is to cover all targets with the crates. The hero can push a single crate but never pull one. Only one crate can be pushed at a time. A crate that is against the wall or another crate cannot be pushed. So it gets tricky when you push crates to some corner. 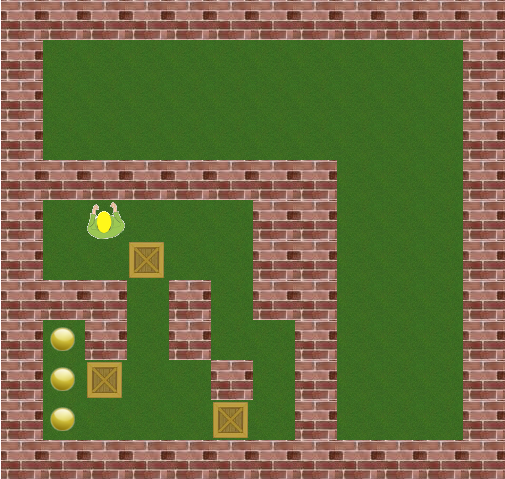 The game is a clone of the classic 'Box World' that I had played long ago in school. I just wrote this one in JS as an exercise. Let's dissect and see how it was written. I would really appreciate it if you can leave some suggestions at the end. One of the main reasons I loved Matlab in college was that everything was a matrix. It was like some deep philosophical thing - everything is Brahman. An image can be represented as a matrix, with each point being a number in the matrix and the value being the intensity. RGB frames in colour images are three matrices, all within one matrix. Sound can be represented as a matrix. Basically, everything is a matrix. you will know what you are doing. Once we have defined what each number in a matrix means, we have to write a very important function - a rendering function. This function essentially translates changes in the matrix to changes on screen. What does this mean? This is exactly along the lines of MVC, where the matrix is your model, and the graphics you see on the screen is the view. Changing the matrix behind the scenes changes the model, but someone has to change the view. So you have two options here - Either use some kind of an MVC framework that does this automatically for you, such as AngularJS, etc. (which in my opinion, is an overkill for simple games) or write your own rendering function. Personally, I write my own simple functions for rendering - I call it draw_map(). The draw_map function simply reads the matrix and draws the map, period. In this function, you can represent the numbers by some graphics. Keep all your images in some folder called assets. Next, we need to be able to read input from the user - Just bind keypress or keydown event to the document or window, check if the input key is one among the ones that you want. Otherwise, simply discard it. Again, use some syntactic sugar for key codes. Then comes the important part of the game - The logic. Depending on the key code, check if the move is valid by validating it against the matrix. If it is valid, change the matrix and call the draw map function. If it is not valid, either reject it, or indicate it to the user with a subtle 'invalid move'. Always remember that all changes should be made only to the matrix and no DOM changes should be made whatsoever. So, if you want to increase or decrease points, do it by altering the variable. But the actual display of the score on screen should be done by the rendering function. That's it! You are done with the game. However, games such as these are only as fun as the number of levels in it. You can build only as many levels. To take it to the next level, would be to create a simple game world creator so that your users can design levels and share it with others. The game designer uses the same rendering function, and with some small alterations, a lot of code can be reused. Ensure that the user can play and test out the games she has created. Once that is done, and the game gets validated, enable upload and sharing of the game. Check out Crate's "Create a world" section. It allows you to create worlds and test it, but the publish feature as of now is not linked to any backend servers for persistence. It instead simply spits out a matrix when you "Return to game design" that you can mail to me. Can this be improved further? The answer, according to me, is a resounding yes. A lot of games can be made using this matrix concept, and there are a lot of similarities among these games. The ability to create worlds, uploading and reading games created by others can be the same across games. So, it should be possible to create some kind of a game framework around this. If anyone is interested in building this with me, please let me know. The other way of building a game would be using classes and objects. Perhaps there will be another post about that.